A highly popular Kickstarter project that intends to release the first Android-based video game console has revealed some information recently that lends them a bit of credibility. Muffi Ghadiali, known to come people as a Lab126 member and an important part of the Kindle’s development team, has come forward as one of the OUYA project’s main resources. Admittedly, this is somewhat peripheral to Kindle news. On the other hand, it’s interesting and I feel like talking about it. You’ll have to bear with me here. 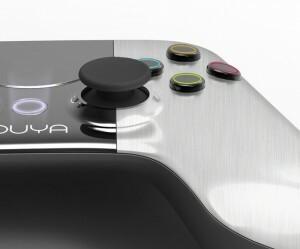 The OUYA console is gaining the attention of gamers and Android developers alike at the moment. Their ambitious goal of $950,000 in 30 days has long since been exceeded. At the moment they are expecting over $5,000,000 from backers. The appeal is understandable, when you look at the goals of the designers. Essentially, they intend to release an Android powered box that plugs into a television. It will be an open platform, unlike other closely managed console projects enjoying popularity today, and cost comparatively little (backers who help fund the project before the end of the Kickstarter period on August 9th can get theirs for $99). The open console aspect is particularly interesting, if also problematic. Developers have almost total control over their product. This means they can charge whatever they want for any part of their apps. A free to play model is being encouraged, but any app that has a free demo available will be welcome. Compare this to Amazon’s Appstore for Android where developers wanting to release their work for the Kindle Fire will often have to wade through weeks of red tape just to issue a patch and it is easy to understand the appeal. Of course this is just intention at the moment. While there is some talk of app curation in the associated storefront, no real details are available yet. They have just now begun working on the interface and such wider concerns are a way off. When it comes time to start selling, however, they will have to balance customer satisfaction against developer freedom to avoid ending up with the same sort of malware proliferation that the Google Play store is just beginning to get under control. What Ghadiali brings to the project is expertise and credibility. The Kindle was an ambitious project that took off in a major way. If somebody who was part of that says that the OUYA console also has a chance despite being in relatively early stages still, then it may be worthwhile to invest in the project. His direction should help to ensure that realistic expectations are adopted and that quality is an important consideration every step of the way. In some ways the OUYA console will be a direct competitor for the Kindle Fire. It is intended entirely as a means of consuming games, but will also allow developers to sell their other applications. Since a television connection will be mandatory, streaming video and other such visually impressive applications will enjoy a far superior experience in most cases. It is hard to imagine a video game console having a major impact on the Kindle Fire given that it is a tablet, but they’re both budget devices running Android that offer media consumption as their primary purpose. It could be interesting to see how they interact down the line. Will Nvidia’s Kai Platform Hurt the Kindle Fire? The most recent development in tablet technology seems to be coming from Nvidia this time around. Rob Csonger, a VP from the company, explained that the new line of tablets they are developing will be able to keep costs down in the $199 range, allowing them to compete directly with the Kindle Fire on price. The Nvideo Kai platform, which incidentally is unlikely to be the final name of the new product when it is released, is meant to take advantage of a lot of the Tegra 3 design. Low power consumption, inexpensive components, and a lot of power for the money are characteristic of the chipset. While this could bring around a fair amount of interest, given that the Kindle Fire has driven prices down on 7″ tablets to a point where other products are having trouble competing, it remains to be seen who will take advantage of the new technology and when. Many are speculating that the first major offering to make use of Kai will be the Google / Asus project that we have heard a great deal of speculation about. Google’s I/O conference is coming up and would make a perfect occasion to present such a device. They already had to set back its release when they were unable to make a decent tablet around the $200 price range to compete with the Kindle Fire. That would make a Kai tablet ideal for both Google and Nvidia to show off what they can do and perhaps pull some of the Android market away from Amazon’s control. There isn’t anything to say that Amazon would be unable or unwilling to make use of the same technology, naturally. They are going to be facing stiff competition when introducing a larger Kindle Fire tablet that will undoubtedly draw comparisons with the market-leading iPad and having the extra power that a quad-core design offers might well be important. Toward the end of the year, when the first Windows 8 tablets are released, this will be even more important. Android is nice, but it doesn’t quite measure up in terms of performance right now so every advantage is welcome. No matter how much some people might want it to be, this will not spell the end of the Kindle Fire. At best, it will help keep all-purpose Android tablets relevant as we move forward into a world of far more intense competition. The option to buy larger, cheaper, more powerful tablets is likely to be appealing to many people. These won’t replace tablets designed for pure consumption like the Kindle Fire unless they can severely undercut on price, which they can’t, but it would be even worse for the Kindle Fire to kill off the rest of the Android tablet market than it would be for the Android tablet market to shut out the Kindle Fire. Competition is good for the consumer. Google has announced an immediate change of their marketing for the Android Marketplace. It shall henceforth be known as “Google Play”. Now, possibly I’m reading too much into this but it sounds a lot like they saw what Amazon had pulled off with the Kindle Fire and realized that it was possible to break consumption away from production in the area of mobile devices. After all, you are clearly not targeting enterprise users by sending them to Play, right? 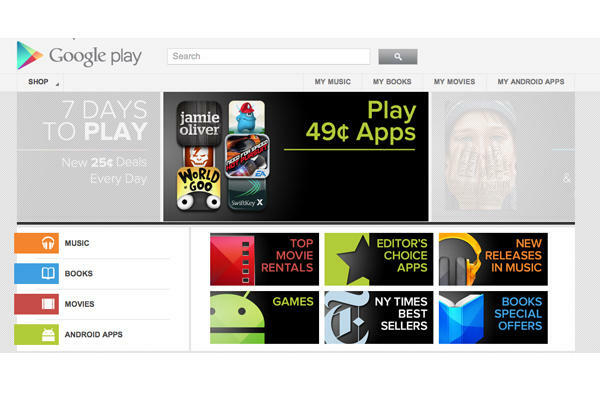 Google Play is more than just a rebranding of the Marketplace, of course. It is an effort to bring together Google’s apps, movies, eBooks, and music in a single package for easy consumption. Anybody familiar with the Kindle Fire or the philosophy it embraces will probably be noticing some interesting similarities right away from the description, honestly. All Google Play services will be entirely cloud-based much like what Amazon has been doing, so that all of your content is available at once regardless of storage space available on any particular device. For those who are already using the Google Marketplace options, there should be a smooth roll-out. Most people are reporting that the apps have already updated, much of the time without users so much as noticing the change at first. All content that you own through Google is immediately available in the new apps, so the transition should be quite smooth. It will encompass all geographic areas, with what Play content is available being determined by the individual market. Canada and the UK have Movies, eBooks, and Apps; Australia has eBooks and Apps; most areas have at least the App store. No real functional change, in many ways. What makes this significant is what it means going forward. Clearly Google is going to be aiming directly as consumer markets with Play, following the example set by the Kindle Fire (in preparation for their rumored 7” tablet?). This was where most of these integrated services were generally heading toward anyway, though, however much the Android Marketplace offered options for all activities. By making it explicit, Google has the opportunity to specifically target business users with a more direct approach. It is not hard to imagine an expansion of Google’s production based products in the very near future. Sadly, this new set of apps will not make it any easier for Kindle Fire users to access Google’s services without roundabout methods or rooting of the device. While this likely would have been a good opportunity for the company to slip in a way to let Amazon’s customers choose between the stores, it is probable that Amazon locked that down fairly tightly before things even started to ship. At this point side-loaded apps from the new service will either fail to install in the first place or never load properly once installed. Competition between the two over who gets the most popular closed ecosystem will have to take place as scheduled when Google’s own hardware sees the light of day. The Sony Reader was the first to get touch screen technology. It set off a big touch screen craze that included all of the major e-readers: Kindle, Nook, and Kobo. The Kindle Touch in turn became Amazon’s bestselling e-ink Kindle. So, Sony has a some good ideas going as far as e-readers go. I happened upon an article about a foldable tablet that the company is currently preparing for release next week. The new tablet, called the Tablet P, will have dual screens, one on each side of the foldable hinges. My biggest question in regards to the screens is how they will mesh together for the display. Will they show separate content? Do they somehow come together to create a larger display? The odd thing is that the Tablet P will feature last year’s Android operating system, Honeycomb. That will be a big drawback right there. By making this table foldable, it is protecting the screen from scratches and dings, so that is a big plus. Although Apple was onto something when it created a smart cover to protect the iPad’s screen . Sony’s new tablet also includes a camera, which is not currently available on the Kindle Fire. Obviously, there are some real winners in the e-reader and tablet market, most notably, the Kindle and iPad, but is still fun to explore the other ideas are floating around. Despite the Tablet P’s lack of computing power and poor sales outlook, it sparks an idea that can be developed further to grab the attention of consumers. I would really like to see the major players in the tablet and e-reader world become powerful enough to handle heavier computing. It would be nice to have the benefits of both in one device. The foldable tablet could emerge as a hybrid laptop/tablet device. The tablet would be hinged to a keyboard, but also removable. So, we’ll see what happens. It is always fun to speculate on the future of technology. Android has seized a greater share of the tablet market than ever before in the last year, with fourth quarter usage of Android tablets up to 39% of the total (up from 29% the previous year). A great deal of this improvement comes as a result of Amazon’s Kindle Fire tablet. With the whole tablet market seeing huge growth (including Apple’s sales numbers we saw around 150% growth and a total of over 25 million tablets sold) it is no small feat for something as new as the Kindle Fire to already be edging ahead of more established competition. These numbers deal specifically with device usage as reported by analytics firm Flurry, based on app sessions. Given the importance of content sales compared to hardware profits, this is probably a significantly better estimate of consumer preference than simple sales or activations. Thanks to this data, we can tell that the Kindle Fire’s approach to content is making a pretty big difference to the user. The alternative method of analyzing the success of the Kindle Fire would be along the lines of what Google has been doing when describing Android as building up momentum compared to the competition. That would be looking at device activations. While this is not misleading, necessarily, it does focus entirely on numbers that fail to directly equate to post-purchase satisfaction. Even using this method, the Kindle Fire is doing amazingly. Approximately 10.5 million android tablets were sold in Q4 2011. While Amazon is not releasing sales numbers, we can say with a fair degree of certainty that around 5-6 million of those were Kindle Fires. The numbers are favorable, to say the least. While there is not any indication that this is having a negative effect on iPad sales, there is also little to support the notion that Amazon had any intention of making a direct attack on Apple with this first tablet. It is likely, given how much the two companies overlap in their digital media sales markets that there will be some more direct Kindle vs iPad competition down the road, but a 7″ $200 tablet that clearly lacks the potential to replace even the functionality of a netbook is not something you could take seriously if they were heading for a confrontation with the iPad 2 right away. The biggest impact of all this is probably going to be on Google. Since Amazon is running such a heavily forked version of Android, and since it lacks easy access to Google’s app marketplace, the success of the Kindle Fire will tend to draw people away from Google services despite technically relying on their original concept. This has the added effect of drawing developers away from the more general marketplace. While Amazon’s Appstore has not been a favorite destination for many developers thus far due to the heavy oversight and lengthy screening process for even minor updates, the most important thing will always be going where the customers are. Right now, for better or worse, it is looking very much like that is the Kindle Fire if you’re talking Android tablets. Despite the relative technical differences between the new Barnes & Noble Nook Tablet and the Amazon Kindle Fire, I think that it is fair to say that Amazon’s product offers more right out of the box. For the layman user, somebody with no stake in a particular platform and no desire to have to jump through hoops to pull the greatest possible performance out of their electronics, the available content and overall experience of the Fire is immediately superior. Let’s assume, for the sake of argument, that you are not that user. Even more, let’s assume that you are considering buying one of the new $200 Tablet PCs being released by these eReading giants with the sole intention of rooting it and making it into an all purpose generic Android Tablet. It doesn’t take huge amounts of work under most circumstances. Andrei already posted instructions to this Blog on how to root the Kindle Fire and there is a great deal of headway being made on the Nook Tablet. Custom Android ROMs are sure to follow in the near future. In the end, chances are good that the only prerequisite will be a willingness to spend the time and effort to go through a list of instructions. Under these circumstances, the most important factor is the hardware. Here, the Nook Tablet is the way to go. It has twice the RAM of the Kindle Fire, as well as twice the internal storage space. The expandable memory slot is a big incentive as well, of course. Other than those bits, the processors, screens, size, and weight are all either exactly equivalent or so close that it won’t factor in much. Probably the only other relevant difference is the fact that the Nook has some external volume controls that come in handy from time to time. Before making any real decisions on this matter, however, I recommend taking both devices for a test drive. While the Nook Tablet‘s initial setup has some major flaws, from locking up the majority of the storage space to simply lacking a halfway decent app store, it is still pretty smooth and comes equipped to take on most third-party video purchases. You also get the added advantage of easily accessible support at every Barnes & Noble location nationwide. The Kindle Fire, on the other hand, offers deep Amazon integration. At a glance this is troublesome and a blatant attempt to lock customers in, but they have gone out of their way to keep the platform pretty open. Competitor apps are in their Appstore (itself less well populated than the Google Marketplace but far better policed) and it isn’t hard to install things acquired elsewhere. Even the Nook reader app has no trouble. The interface is smooth, looks good, and performs better than most people would expect. Really the only complaint here is the lack of video format compatibility, which is why it was worth mentioning for the Nook. Either way you’re getting a good device, but keep in mind what is being bought. These are not really intended to be all purpose tablets the way the iPad is and to treat them as such will likely disappoint. If you do decide to break away from the cultivated experiences provided then the minimal hardware might be more apparent than it otherwise would be. Personally, I had intended to ditch the Amazon firmware on the Kindle Fire after testing it out just enough to write about it knowledgeably. It was good enough to change my mind and might do the same for you. As has been noted a few times in the past, Amazon didn’t really put any effort into securing their tablet against modification. The Kindle Fire was bound to be rooted and they knew that would be the case well before it was even officially announced, I’m sure. Since it started arriving in the mail, there have been quick results along these lines. Andrei, here on our site, has posted instructions on how to root your own Kindle Fire for easy access to things like the Android Marketplace. What many have been waiting for, though, is the announcement that custom ROMs were available to replace the default Kindle Fire OS. This isn’t to say that there is anything wrong with what Amazon has done in their release. It’s a great one and serves to highlight the capabilities of the tablet quite well. For those who prefer to avoid being attached permanently to a company like Amazon for whatever reason, however, it is nice to have the option to make use of their affordable yet powerful hardware without the attached software. That’s where developments from the XDA-Developers forum come in. One of their users has been able to get a basic installation of Google’s latest Android release, Ice Cream Sandwich, working on the Kindle Fire. So far, “working” is a relative term since at the time of this writing it still lacked the ability to use the audio, WiFi, accelerometer, or light sensor (yes, the Kindle Fire has a light sensor, they have just got it disabled at the moment since it was overly sensitive at the time of launch). This is a big step in the right direction, however, and once some of the bugs and deficiencies are ironed out will likely result in making the Kindle Fire a great option for Android fans who might otherwise be put off by Amazon’s proprietary build. 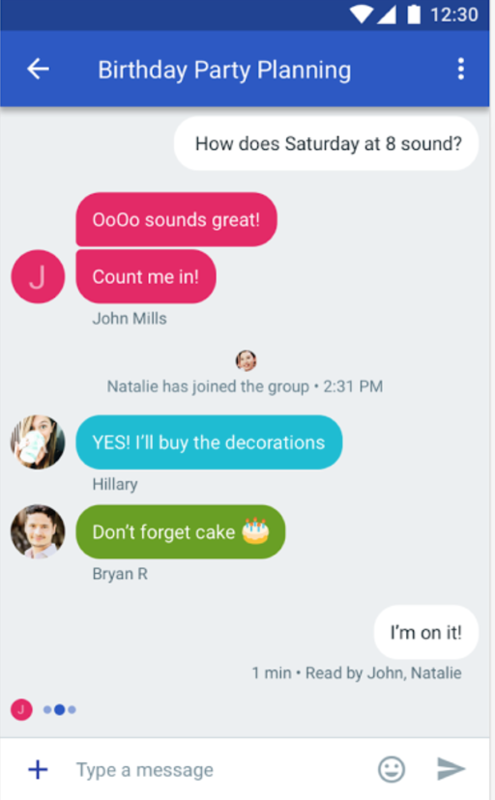 While this will definitely open up the user options in a few ways, specifically by allowing a greater degree of configurability and better integrating the Android Marketplace (as compared to simply rooting and installing it), there are a couple down sides. Most importantly, you lose access to the Amazon service integration. 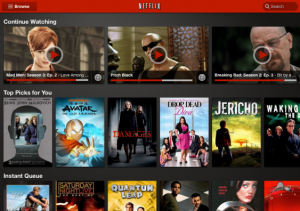 While most people considering this option are likely looking for exactly that, the Kindle Fire’s limited storage space can make the Cloud Storage a vital part of daily use and the streaming options for music and movies provide an experience that many find superior to their general app equivalencies. The freedom to install anything you want will also lead to the opportunity to pick up apps that are not optimized for the Kindle Fire’s specs in any way. This can lead to poor performance at best and complete waste of a purchase if you aren’t careful. While I wouldn’t advise anybody to jump up and grab the current working build of ICS for the Kindle Fire, given its incompleteness, you may want to keep an eye on it. Personally I love the interface that Amazon has come up with, but that doesn’t mean somebody else won’t manage to improve on it. The best performing option will always be the preferable one in the end, and there is a great community of Android developers out there that can’t wait to get the Kindle Fire working just the way they like it. It was known well ahead of the official announcement for the device ever took place that the Kindle Fire would be intended for video more than anything else. Perhaps due to that pressure and perhaps just as part of an overall trend in the market, the Nook Tablet was designed along similar lines. While this doesn’t necessarily mean much on its own, it spurred along at least one other development that might mean a great deal more attention for the Android community as a whole. Amazon’s intent to promote their own streaming video service is clear. Their library has been growing quickly over time, including many titles being given away “free” with Amazon Prime. This is naturally something of a concern for a company like Netflix that is suddenly faced with competition from somebody as big as Amazon. Although Netflix has not commented on it, something definitely spurred them along to push forward their new tablet app upgrade for Android weeks or months ahead of iOS. The Nook Tablet practically relies on Netflix and other streaming services to function, all the more so because Barnes & Noble currently offers nothing analogous to Amazon’s video services. They also began advertising a uniquely deep connection with Netflix immediately following the reveal. As Kindle Fire owners have likely noticed by now, the Netflix app in the Amazon App Store isn’t exactly lacking either. They went for the maximum possible audience with this update and it seems likely to take. The implications here go beyond benefits for owners of these new 7″ tablets, however nice those are to have. This is one of the first times that the Android platform has received special attention ahead of the iOS equivalent. That sort of thing does not happen without a fair degree of confidence in the potential profitability. If the Kindle Fire alone, or even the collection group of it and all of the competing $200 tablets springing up from companies like B&N and Kobo, is considered important enough to be prioritized ahead of the market dominating iPad then it could easily be a sign that tides are changing. Part of the bar to Android’s widespread adoption in tablets has been the fact that quality development tends to get prioritized for the competition. Whether you blame it on the fragmentation of the ecosystem due to frequent non-mandatory upgrades, lack of faith in Google’s offering as a whole, or the lack of a truly major name product to line up behind, the situation has now changed. With luck, this will build up some momentum. While I have nothing against Apple or the iPad, some heated competition would go a long way toward not only improving their product but creating some genuinely functional alternatives. The strength of iOS that everybody else lacks isn’t the iPad’s hardware or aesthetic. Its main virtue is the functionality that primarily comes from the Apple App Store. 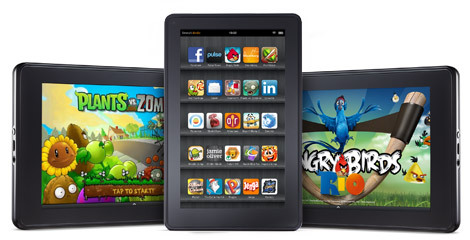 Neither the Kindle Fire nor the Amazon App Store is a match for Apple. It isn’t likely that a single company or product will be any time soon. What it does do is get the ball rolling, so to speak.